5 Steps To Stop Holding Yourself Back - Motivate Amaze Be GREAT: The Motivation and Inspiration for Self-Improvement you need! You have dreams, you have pinpointed your goals and you are working everyday on the small things that will allow you to reach those goals. Congratulations!! But, on the other side of things, sometimes you feel like not doing those tasks, or, you still do them but you also found yourself doing other small things, that don't relate whatsoever with your goals, in fact they are the complete opposite of what you should be doing. The naked true is that you're holding yourself back! It's very important that you take this conclusion, the more you avoid and blame others or things for your own faults, you're are stepping way from success. Situation D - You are a great professional and you want to spend more time with your kids because you know that you work more hours than you should and that's hurting your family relationship. By the contrary you simply can't stop working and your children are being left behind. After you set your goals you need to identify the patterns, you may have, that don't contribute positively to your goal. Be really honest about it, make no drama. Your will to reach a particular goal as to become stronger than the desire of running some specific limiting pattern. Once you've established that on your gut you'll feel an unstoppable power. An that's what you have to chase. The pleasure of achieving a goal has to become your driving force, not the pain of leaving an old habit left behind. Habits and patterns come as they go, don't think they are impossible to get rid of, because in reality they aren't. But our mind makes them bigger than they are. That's why you have to be really conscious about it, you have to analyze your life and identify with precision what kind of patterns are you running that stop you from achieving your goals. Make a list, write them, memorize them, direct your attention to them. Don't act like they aren't there, because inevitably they are! Acknowledge them. 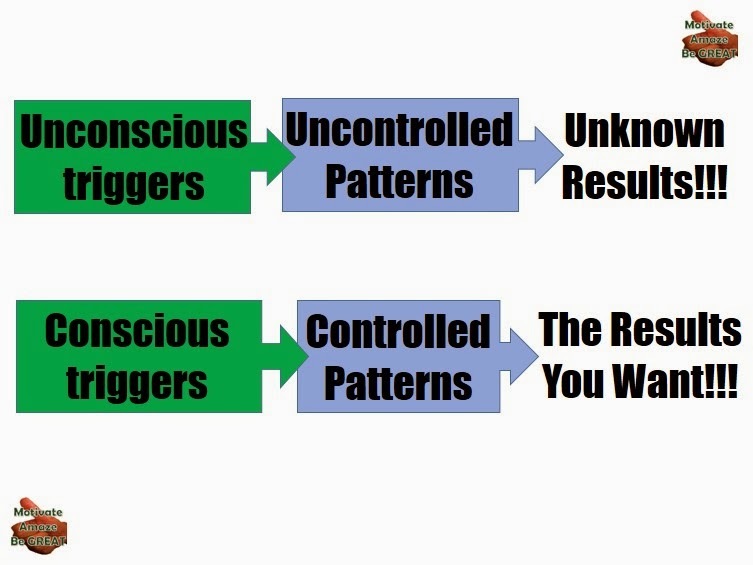 Once you have located the limiting patterns you must do something about them. Hopefully you stop doing them once you identify them, but there are patterns that are really sticky, and you can't get rid of them easily. Even though you took aim at them they still remain in your life if you don't have a specific strategy to address them. Be strategic about it, it all begins with goal setting and precision in locating the limiting patterns that stop you to reach your goals. Make in your head goals more important than patterns. After you've done that, probably bad patterns will become less important and you'll have the tendency of stop doing them with time. Of course, you still have some old habits pending, what you need to do, once again, it's to stop doing them no matter what! Situation D - Make a pause at work, stop working non stop. The rush of achieving more and more it's the trigger. For all these cases identifying and stopping the trigger are the first steps. The next step it's to replace the trigger you've found with a new one that takes you to run the pattern you want, the pattern that takes you to accomplish your goals! Situation D - Make pauses at work and take the time to look at pictures of your kids. If they can, call them at work breaks, you'll be switching your focus to them. - Identify the patterns, see in what way they contribute to your goals. - If they are stopping you, identify the specific triggers that enable you to run those bad patterns. - Replace them with new better ones, that lead you to run good patterns. - Do them as often as you can. If you do this reaching your goals will be easier and quicker in your life.